I’m sitting in my living room, tree lit, winter village up with twinkle lights all around it, candles glowing softly throughout the house. Music is playing quietly on the ipod and our daughter is at the family laptop typing up a letter to her Gram while my husband is upstairs working. 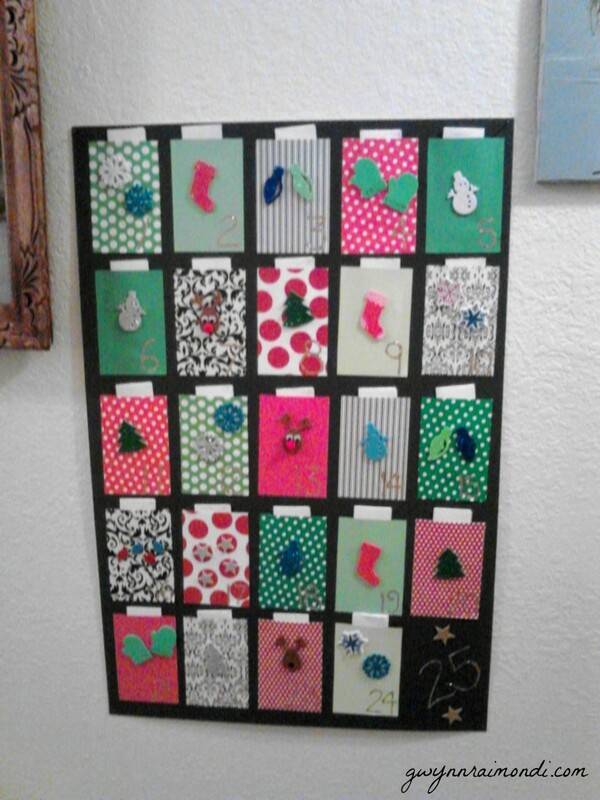 Our new Advent calendar is up on the wall. I made the calendar this year and each day has a special activity for us. Traditionally, since our daughter’s second Christmas season when she was a little over 18 months, I make a countdown chain and each night she gets to tear off a link of the chain to see how much closer to Christmas we are. I didn’t intend on doing that this year, thinking this new calendar tradition would replace the old countdown chain. When I told our daughter that the experiential calendar I made was going to be our Advent calendar, that we wouldn’t have the countdown chain, she got so upset. She wanted the countdown chain. I hadn’t taken into consideration the fact that the chain IS a family tradition, whether it was my intention or not. While I was thinking it’s just some construction paper and glitter glue, my daughter is thinking this is family ritual, holiday tradition. We made the countdown chain together this year. She helped cut the strips and helped me glue some of the chain links. 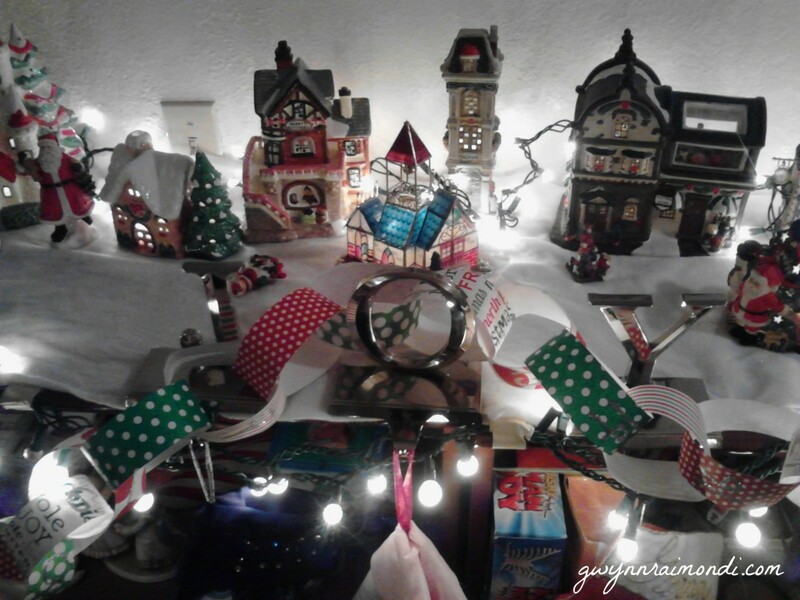 After a lot of consideration, she decided she wanted it to hang across the bookcases that also holds our stockings and the winter village, where it traditionally lives. While the countdown chain is an “old” tradition for our family, having our daughter help me make it is new this year. It marks the beginning of a new stage in our family, as she grows older and more independent. As she wields scissors and helps make decisions about where some of the holiday decorations should go we continue our quiet traditions with love and anticipation. We stay cozy in the old–decorating our tree on Thanksgiving Day, hanging our stockings from the JOY mantle hangers–as we bravely go into the unknown of a holiday without shopping, seeing the magic and abundance in the quiet moments instead of creating large moments filled with excess. As our home transforms to welcome the holiday season and the countdown to days filled with more light begins, I also bravely embark on a new adventure. This new site marks the launch of my new business, the quiet beginning of acknowledging my special gifts and offering them to you. I look forward to our journey together, through this beautiful holiday season and beyond. May we all find Joy, Connection and Light in the quiet–and not so quiet–moments this time of year brings. Did you enjoy reading this? Then sign up for my weekly love letter right here.